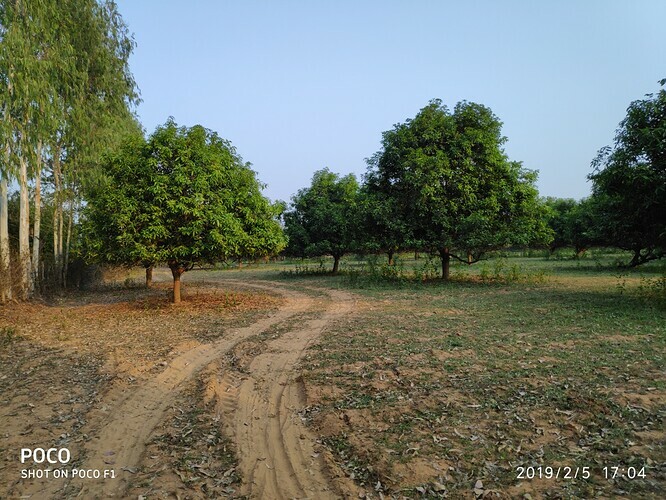 I have 20 acre mango garden in a village near Bhadrachalam in Khammam dist, Telangana State, well connected by road, power and telecom. My average income has been 20k per acre for the last 4 years. If I go in for oilpalm I can get about 60k. But I am feeling bad to remove the mango in its prime. Hence looking for suitable intercrops to get atleast 45k per acre. Spacing between plant to plant is 33ft. The age of the garden is 10 years, soil is sandy loam, well drained, one bore well with 2.5inch full delivery with barbed wire fencing around. I am prepared to lease out for intercrops. Or mango plus intercrops. But they main intention is to know which intercrops are suitable with all details from sowing to marketing. Pleas see the pics. Try Drumstick. It will easily grow and it will fix nitrogen for the mango trees as well. Drumstick pods and leaves can be sold easily. The success of inter cropping in orchard depends very much on the selection of compatible crop combination and the geometry of the planting in which each crop exploits a destined and different zone of atmosphere and soil. Root / Rhizome / Tuber crops i.e. Turmeric , Sweet potato, Elephant foot , Cassava , Onion etc. Turmeric as intercrop in mango orchard has been found not only to assist in suppressing the population of trunk borers , termites and gummosis causing pathogens in soil , but also provided additional income from the harvest of the rhizomes , 9 months after planting . Seasonal vegetables i.e. Cabbage, cauliflower, tomato, Brinjal, Cucumber, Pumpkin, Bitter gourd, Okra , Chilli etc. that have their roots within 25 cms depth of the soil and are short term are considered good for inter cropping in mango orchard . In the annual Leguminous crops category , due consideration should be given to the legumes such as Pea, Moth bean, Black gram and Green gram etc. What is meant by first and second layers? Should I understand that these crops should be inter mixed or intercropped, i e sown and cultivated in the same area simultaneously? Can u please also throw light on recommended seasonality of these crops? New generation agriculture is based on the canopy layers of the forest –it’s an intentional cultivation of edible, medicinal or speciality crops together , tagged as multi level , multi tier , multi crop , inter crop etc. I’m afraid you may not get success in canopy cultivation i.e. multi layer or intercrop in your orchard , as your soil is no longer a living soil . Top soil stopped growing weeds as well . Growth of weeds on no tillage land is a positive sign of soil health ! Weeds actually protect our topsoil from the eroding forces of rain, wind and sun, accumulate various elements from the subsoil, particularly trace elements, and transport them to the soil surface etc. In conventional agricultural systems we tend to think of the soil as a lifeless medium with the sole purpose of holding our plants upright , but in new definition of agriculture the complex ecosystem below the ground known as “ soil-food-web “ micronutrients are considered important component which serves the function of returning everything once living back into the soil. This complex ecosystem is comprised of endless multitudes or soil organisms which process materials to break them down, and release nutrients in a form that plants can use. Color is a physical property of soils that allows us to know some of its most important characteristics, such as mineral composition, age and soil processes (chemical alteration, carbonate accumulation, the presence of humified organic matter, etc.). I would suggest first feed the soil and revive soil health ! As the spacing between mango trees is 33feet it is enough to go for inter crops. And you have sufficient water to irrigate mango as well intercrop. You have two options one is Papaya and another one is guava. Both are suitable for your mango orchard. Papaya is a short term crop with a life span of 2-3 years. If you have enough time to spare ie to visit the farm atlease 4 times in a month, you can go ahead. Or you can choose Guava. You can prefer either allahabad safeda or VNR Bihi for guava.